So I was on the Twitter just now and saw this and almost fell off the bed. Has anyone heard of this actually being a thing?! It's on the French RSD list. I'm guessing it's the original alternate BOTT, which will be nice to own. It's been discussed and even pictured in the RSD 2019 thread. I can't make up my mind on this. Someone hooked me up recently with the tracks but this seems like a really neat release. I didn't get the recent 2 LP set only because I felt like I could compile and enjoy my own cdrs from the same material. Now, with this release, I guess its just as or more tempting. I guess this could be like BOTT III? - TP/RSD, Official Album, 2LP BS release...Maybe I'll just try to buy all 3 if possible lol at one of the stores the day of RSD. mr.dave, Scope J, Richard--W and 21 others like this. Yeah, that will make me go to RSD. So far, nothing looks all that hot except this. paulmccartneyistheman, Joti Cover, Ricardo Cosinaro and 4 others like this. I would preorder the MFSL One-Step of Blood on the Tracks and ignore all other reissues beforehand. RSD releases are most often plentiful on the secondary market years after the rush of urgency. Both the audio and collectabilty of the One-Step will surpass a RSD reissue. wavethatflag, mr.dave, StateOfTheArt and 9 others like this. The Beave and StateOfTheArt like this. This'll be sold like hot cakes! I wanna have one copy, too, so need to be fast. Vinyl_Blues, ted321, GimmieSomeTruth and 4 others like this. Hmmm....I think this is coming out due to a bit of backlash about not including this in the box set. Hopefully they’ll do this on cd at some point as well. paulmccartneyistheman, joannenugent, vegafleet and 6 others like this. Backlash? I wonder if perhaps this was the plan all along? Either way is perfect for RSD. paulmccartneyistheman, joannenugent, MichaelXX2 and 5 others like this. perhaps this was the plan all along? No. Wasn’t planned as far as I’m aware. This looks like it was decided more recently. What's the day it will be available? Has anyone seen the number that will be pressed? I read that there will be 8000 copies pressed. This is about £130 over here. You think this will be so much better than the last MFSL? That is a very good question, and one about 7500 future buyers of the One-Step would like to know. I can say that the What's Going On and Abraxas One-Steps both had present day, 33rpm MFSL pressings released. In both cases the overwhelming consensus is that the One-Step pressings were superior to there 33rpm counterparts. 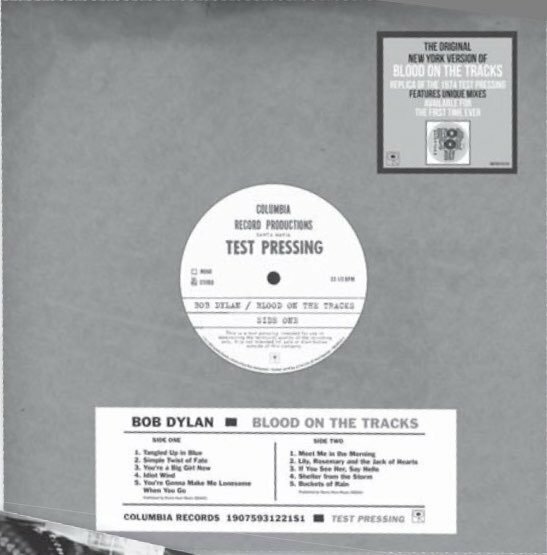 That being said, my further research into the Blood on the Tracks, RSD 'test pressing' has enlightened me to the fact that the songs on this release are different takes than what's on the traditional album. Now that I know that, I really can't say that the One-Step can replace it, and I was premature in that post above. There is a historic significance to the RSD release, and I can absolutely understand how it stands alone as a historic recording. I still would encourage those who have a love for Blood on the Tracks to also consider the One-Step, although it is now apparent to me that it could not replace the 'Test Pressing' edition. I apologize for speaking out of ignorance. DavidD, Cervelo, SoundDoctor and 2 others like this. The recent MFSL Gain 2, Ultra Analog LP mastered and cut by Krieg Wunderlich was pretty good. Not sure if I want to spend a premium to find out what else could be gained from this album. But it's Dylan so the 3000 copies should sell out pretty quick. But it's Dylan so the 3000 copies should sell out pretty quick.